We intend and hope that this, the first volume in the series Liturgiam Aestimare : Appreciating the Liturgy, stand in continuity with the developing tradition of liturgical research and renewal. First, we see ourselves to be in continuity with Abbot Fernand Cabrol, Dom Marius Férotin and Dom Louis Gougaud of St Michael’s Abbey, Farnborough, whose patient study and publications contributed so much to the liturgical movement and renewal at the beginning of the twentieth century. Second, we see ourselves to be in continuity with Doms Leo Cunibert Mohlberg, Leo Eisenhöfer, Peter Siffrin and Anselm Strittmatter of the former Institutum Liturgicum (1950-1967) atSant’Anselmo, Rome, who prepared for the liturgical renewal, which would be mandated by the Second Vatican Council, through their corpus of critical editions of ancient liturgical documents published in the corpus Rerum Ecclesiasticarum Documenta (RED). Third, we see ourselves to be in continuity with the methodology developed and used at the Pontifical Institute of Liturgy established by Pope John XXIII at Sant’Anselmo on 15 June 1962. In the forty years since the publication of the four Constitutions of the Second Vatican Council, naturally the first phase of work was that of producing new editiones typicae, a process that lasted from the establishment of the Consilium until the publication of the Martyrologium Romanum. Since the production of these editions, there has been a second phase of work, that of translating the editiones typicae into the vernacular languages and then of implementing the renewed liturgical books mandated by the Council in their vernacular translations. a. Restore the pre-conciliar liturgy (the restoration model). b. Reform the reform (revisit and change the initial direction of the liturgical reform). c. Advance the reform (continue the official agenda). d. Re-catholicize the reform (stop the reform; spiritualize or internalize the liturgy). e. Inculturate the reform (continue the reform following SC 37-40). Mannion’s further article on the models or paradigms of liturgical musical style3 also illustrates another balance of emphases between the ‘conventual model’ of liturgy inspired by Dom Guéranger and the Solesmes renewal of monastic music and life in which ministry is professional and the participation of the faithful is primarily visual and auditory; and the ‘participatory or ritual model’ derived from the tradition founded by Dom Lambert Beauduin, wherein participation is seen to be ministerial. We have noticed that little attention has been given to the detailed study of the renewed editiones typicae, because the effort shifted to translating and implementing them pastorally. The time is now opportune, we believe, to deepen the academic study and appreciation of the renewed editiones typicae. Accordingly, at the meeting of Societas Liturgica in Palermo, August 2007, we proposed a new model of liturgical renewal, which we call Liturgiam Aestimare : Appreciating the Liturgy, for, to the degree to which we deepen our appreciation of the current liturgical documents, will the Church discern the way forward. Thus, we began to develop the project Documenta Rerum Ecclesiasticarum Instaurata, « DREI », which offers a hermeneutical analysis of the liturgical documents renewed (Instaurata) at the behest of the Council, that the Church may further discern the course of liturgical renewal. The « DREI » project employs a new methodology for interpreting liturgical texts that combines the clear and detailed understanding of the Latin language, as taught by Reginaldus Foster OCD, Rome, and the textual hermeneutic of Renato De Zan, a professor of the Pontifical Liturgical Institute, Rome. We have already employed the « DREI » methodology in our paper given at Palermo and in a chapter on the collects of the three scrutinies. More specifically, in the article by De Zan cited above, eight keys are presented for interpreting liturgical texts. There, they are arranged according to four dimensions and four foundations. Having applied this new method of liturgical study, we have discerned a further interpretative key: Christian maturation by developmental steps. We present this new interpretative key in this and hopefully subsequent volumes, as we continue to investigate further aspects of the truth that, in the course of history, have been forgotten or overlooked, and which we now hope to recover. We have come to perceive in the euchology a developmental process of Christian maturation. As Cyril of Jerusalem (c. 315-386) says that we are the offspring of that nuptial chamber who come to feast first as infants at the breast on the body and blood of Christ, so we might add that as we are enabled by the recurring and sustaining gift of God’s self to mature first into the freedom of the children of God and then to our full stature as adult daughters and sons of God, we are called once again to enter into the same bridal chamber as spouse and therefore to a new generativity. Thus, we are called to do the work of God, both through full conscious and active participation in the liturgy and through service in the world. We have learned that in the liturgy those empowered by God, who have already given themselves to be immersed in baptism and received as God’s own, now with the whole church present their offerings as representative of their ongoing self-gift to God and neighbour with the prayer that God receive the gifts, thereby perpetuating the mutual self-gift originally made in baptism and praying both that this exchange of gifts may come to its fruition, and that they may pursue the happiness of mutual self-gift in this life and its fullness with God in the next. 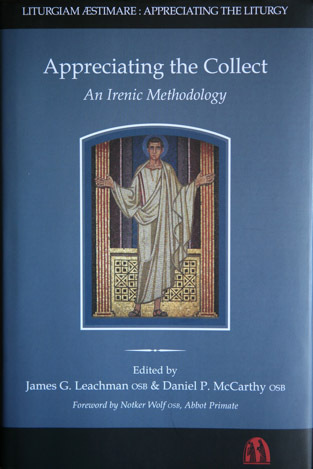 It has been a pleasure to meet and work with this varied and distinguished group of contributors from such different theological and cultural perspectives; and an honour to be able to offer these papers on “Appreciating the Collect: An Irenic Methodology” to a wider audience of those who in study or in celebration wish to deepen their Appreciating the Liturgy. Fr Ephrem Carr OSB is a monk of St. Meinrad Archabbey, Indiana, and professor of eastern liturgies at the Pontifical Institute of Liturgy and at the Patristic Institute, the Augustinianum, Rome. He is editor of the review Ecclesia Orans and of the series Analecta Liturgica. He serves as consultor for the Liturgical Commission of the Vatican Congregation of Oriental Churches and as moderator of the DREI project and the series Appreciating the Liturgy. Fr Reginaldus Thomas Foster OCD is for 40 years a papal Latinist and professor of the Latin language renowned for his unique pedagogical style and presentation of the living Latin language. His patient and clear understanding of the Latin language provides the standard analysis of the language upon which the methodology of the series Appreciating the Liturgy is founded. Fr Anthony Igbekele is a priest of the diocese of Ondo, Nigeria. He completed a Doctorate of Sacred Liturgy at the Pontifical Institute of Liturgy in 2006 writing on: “Eucharist as oblatio and sacrificium in the Latin Fathers”. Apart from his on-going research into patristic eucharistic themes, he is now undertaking a complementary Music course with special focus on composition and counterpoint at the Institute Musica Sacra, Rome. Dr Gerard Moore wrote the seminal doctoral dissertation: Vatican II and the Collects for Ordinary Time: A Study in the Roman Missal (1975). He is assistant professor at the Sydney College of Divinity, Australia, and has just published volume Understanding the General Instruction of the Roman Missal. Dr Bridget Nichols completed her doctoral studies at Durham University, England, writing on Liturgical Hermeneutics:Interpreting Liturgical Rites in Performance. She is Lay Chaplain to the Bishop of Ely and her publications includeLiterature in Christian Perspective and contributions to A Companion to Common Worship. Dr. Nichols is the editor of The Collect in the Churches of the Reformation, to be published by SCM. Fr Patrick Regan OSB was abbot of St. Joseph Abbey, Louisiana, for almost twenty years. He served as President of the Swiss-American Congregation of Benedictines for twelve years. He currently teaches liturgy in the faculties of theology and of the Pontifical Institute of Liturgy both at Sant’Anselmo, Rome. He is co-editor of the series Liturgiam Aestimare :Appreciating the Liturgy, and has contributed many articles to Worship, Collegeville, MN. Mgr Renato De Zan is the professor of liturgical hermeneutics at the Pontifical Institute of Liturgy, professor of Scripture and liturgy at the Institute of Pastoral Liturgy, Padua, and professor at the seminary of Pordenone, Italy. He is a liturgical consultant for the Italian Bishops’ Conference. His literary-critical hermeneutics, as found in his contribution to this volume, is the standard methodology used in Appreciating the Liturgy. Richard Price, Heythrop Journal 55:2 (2014) 351-352. Bruce Harbert, “Book Review”, Usus Antiquior 1:2 (July 2010) 169-17. Go to the St. Benedict Education Foundation comments on our first book. The European Society for Catholic Theology, ET Newsletter (26 February 2009). DTC [Dom Thomas], “Book Reviews”, Pluscarden Benedictines 147 (2009) 21-23. Cuthbert Brogan, “Appreciating the Liturgy”, Pluscarden Review (Summer 2008) 23-27. Association for Latin Liturgy, Newsletter, 134 (Lent 2009) 21. Liturgy Newsletter, A Quarterly Newsletter Prepared by the Liturgy Office of the Catholic Bishops’ Conference of England and Wales 8:3 (May 2008) 2. Philip Gleeson, “Reviews”, New Blackfriars 90 (2009) 618-19. Paul Galbreath, “Between Form and Freedom”, in The Collect in the Churches of the Reformation, ed. B. Nichols (SCM Studies in Worship & Liturgy Series), SCM Press, London 2010, 124, fn. 3. United States Catholic Conference of Bishops, “Readings on the Roman Missal” includes this and several of our books on its reading list as part of its effort to introduce the new Roman Missal on Advent Sunday 2010. Accessed most recently on 27 May 2018 at this link. Uwe Michael Lang, “The Liturgy and Sacred Language”, in T&T Clark companion to liturgy, ed. Alcuin Reid, Bloomsbury T&T Clark, London 2015, pp. 365-382, citation 9, fn. 36. Anscar J. Chupungco, The Prayers of the New Missal: A Homiletic and Catechetical Companion, Liturgical Press, Collegeville MN 2013, 123, fn. 4. Uwe Michael Lang, The Voice of the Church at Prayer: Reflections on Liturgy and Language, Ignatius Press, San Francisco 2012, 89, fn. 33, 34. Patrick Regan, Advent to Pentecost: comparing the seasons in the ordinary and extraordinary forms of the Roman rite, Liturgical Press, Collegeville MN 2012, 122, fn. 31. Paul Turner, At the Supper of the Lamb: A Pastoral and Theological Commentary on the Mass, Liturgy Training Publications, Chicago IL 2011, 23, fn. 2. Andrew Burnham, Heaven and Earth in Little Space: The Re-Enchantment of Liturgy, Canterbury Press, Norwich 2010, 11, fn. 37. 1. F.M. Mannion, “Agendas for Liturgical Reform”, America 175 (1996) 9-16. 2. F.M. Mannion, “The Catholicity of the Liturgy: Shaping a New Agenda”, Masterworks of God: Essays in Liturgical Theory and Practice, Liturgy Training Publications (Hillenbrand Books), Chicago IL 2004, 202-235. 3. F.M. Mannion, “Paradigms in American Catholic Liturgical Music”, Masterworks of God: Essays in Liturgical Theory and Practice, Liturgy Training Publications (Hillenbrand Books), Chicago/ Mundelein IL 2004, 116-143.